Greetings! This is my fourth blog installment talking about some very cool and awesome manatee facts. Manatees usually don’t dive more than 10 feet. However, they can dive as deep as 33 feet, which is about the height of a three-story building. 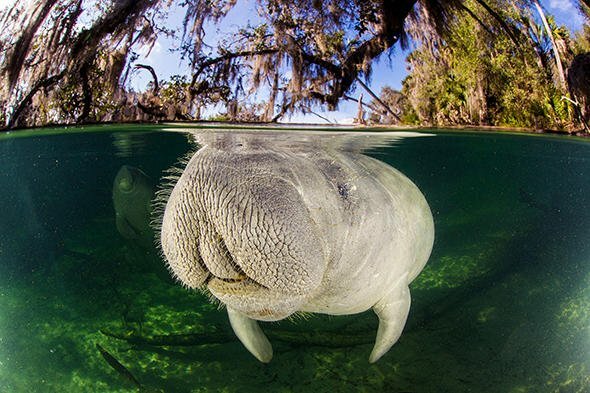 A manatee’s upper lip is large and separated into two areas. The manatee can use them to grab plants with its mouth. And this is done without the manatee turning its head. Looking at a manatee’s flippers, each one has five-finger bones, which are very similar to the bones in a human hand. The flippers help the manatee grab plants just like human arms! The manatee can also use its flippers to pull itself about half way out of the water. Then along the banks it can eat plants that grow along the water’s edge. When a manatee eats it will grind up the food with its teeth, which contain all molars. A manatee has between 24 and 32 molars on its upper and lower jaws. The plants that manatees eat are all covered with sand. This sand grinds and wears down their teeth as they chew it. As a result, the manatee’s worn out teeth fall out, and new ones from the back of its mouth move forward. Researchers call this unique process “marching molars.” Additionally, manatees can grow a lifelong supply of molars! 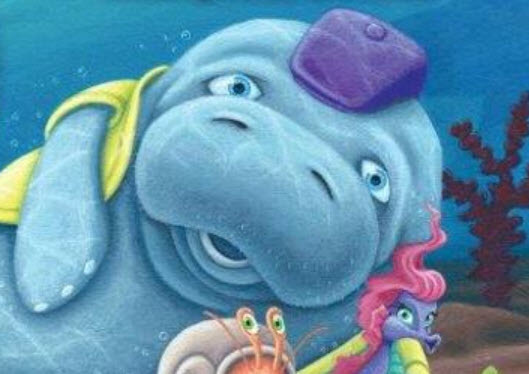 You can also find these cool manatee facts in my children’s educational picture book titled, Kobee Manatee®: Heading Home to Florida. After every meal, manatees will clean their teeth. They remove the dirt and grasses caught between their teeth by rolling small rocks inside their mouths. Then when they’re done, they spit out the rock! Sometimes manatees will even use an anchor rope like dental floss to clean their teeth! Manatees swim through the water by moving their paddle-shaped tails up and down. They steer themselves with their flippers. Manatees can also move or “walk” on shallow sandy bottoms by using their flippers. The manatee does not have eyelashes. It has a transparent eyelid that actually slides across each eye. It works like goggles so the eyeball is protected from the salt water. Also, the manatee does not breathe through its mouth, just through its nostrils. Stay tuned for more awesome manatee facts!